of breakage of the canines. 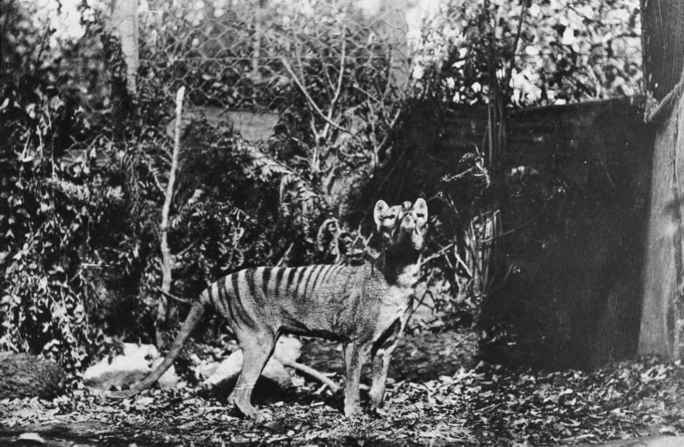 Combined with the dietary records, and in contrast to prey sizes taken by devils and the larger quolls (up to three times their body weight), this combination of features suggests that thylacines did not routinely kill very heavy-bodied prey or prey much larger than themselves (33-66 lb; 15-30 kg). 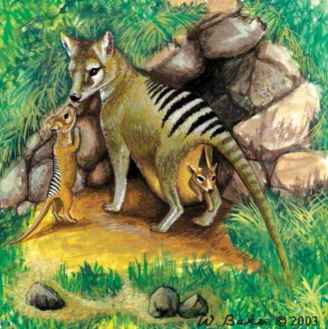 While they are recorded killing kangaroos, it is unlikely that they regularly killed healthy large males (up to 155 lb; 70 kg) or the larger megafauna such as diprotodonts. A similar ovoid cross-sectional shape of the canine teeth to the living larger dasyurid carnivores suggests that thylacines probably killed their prey using a generalized crushing bite used in killing. Tasmanian wolves were probably not swift runners, which is indicated by comparison of their leg bone ratios with other marsupial and placental carnivores. Unlikely to be capable of sustained, fast pursuit, thylacines probably hunted using a combination of stealth, short pursuit, and ambush. Putting all of these pieces of information together, it is likely that the thylacine filled a niche more similar to a medium-sized canid such as a coyote than to a wolf.